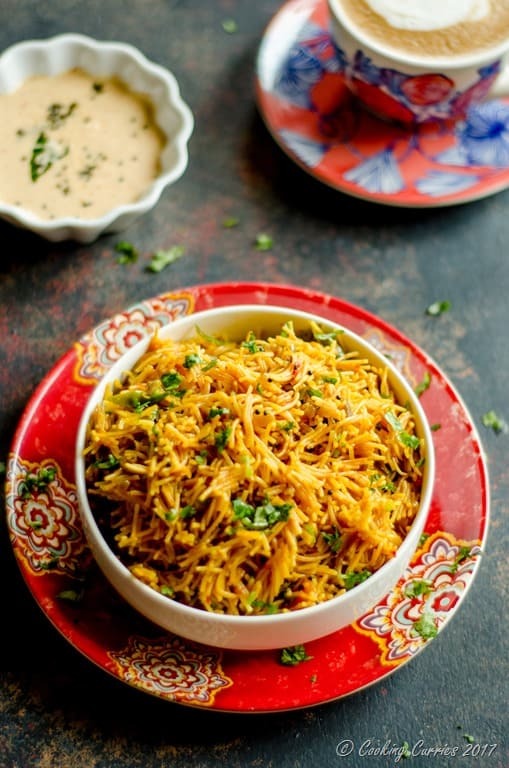 A breakfast that is made fabulous from the bursting flavors in this savory Tomato Semiya Upma along with a side of coconut chutney and a cup of hot coffee, is something that you deserve every morning! 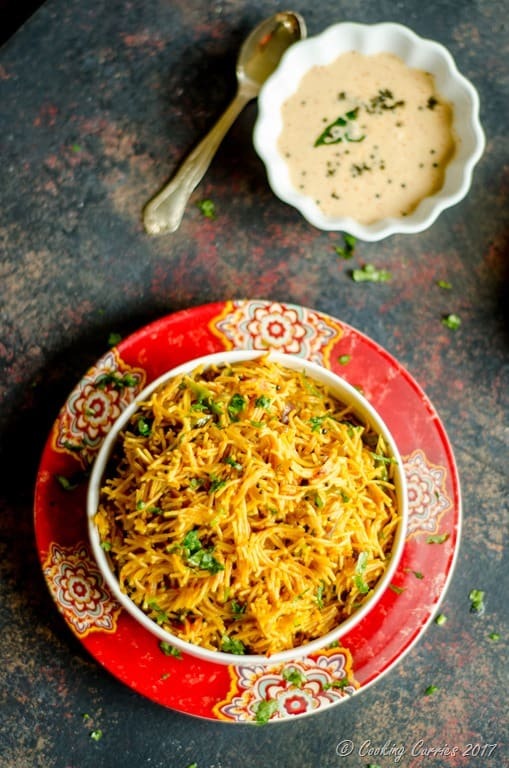 Semiya Upma or Vermicelli Upma is always a favorite in our household. The kiddo calls it noodles upma and he loves it too. I love it too, love how simple it is to make, love how fool proof it almost always is, love how the kiddo will polish his plate off, love how this makes for excellent leftovers, love how it can also take the shape of lunch or dinner if needed. The only thing, if at all, that I don’t love so much about this is the mess that this creates when V eats it. He invariably drops a whole lot of it on the floor – partially from the excitement of eating it and also because it can get a little slippery for him whether he eats it with his hand or with a fork. The clean up is really a pain the you know what. All the little slimy pieces stick on the floor and get so slippery, that it is so difficult to get them off the floor and if you try too hard, you would just end up smushing them on the floor and creating an even bigger mess. Want to know a little trick I use to get them off the floor easily? I simply let them stay there for a while. It tests every ounce of my overly cleanliness conscious self, but once I leave the area and pretend everything is clean and come back to it after a while, the vermicelli bits would have dried up and you can just quickly sweep them off the floor. This is probably the first time I have gone on and on about how to clean a mess created by a certain dish rather than getting to making the dish in the first place. That is because, people, it is really important. As much as the ease of making something that appeals to many, so does the difficult things that come with it makes many to not try making it. It could be the seemingly mile-long list of ingredients, or the page after page of instruction, or how you have heard from everyone around how you cannot “not screw up” a particularly difficult recipe. This clean up bit is something I have heard from many and something I have personally experienced as well. Heat the oil in a kadhai or a heavy bottomed pan. Add the mustard seeds and let them splutter. Add the curry leaves and the onion. Once the onion has softened, it need not turn brown, add the tomatoes, turmeric powder, red chilli powder and the Thai green chillies. Add the vermicelli and keep stirring, so as to not form any lumps. 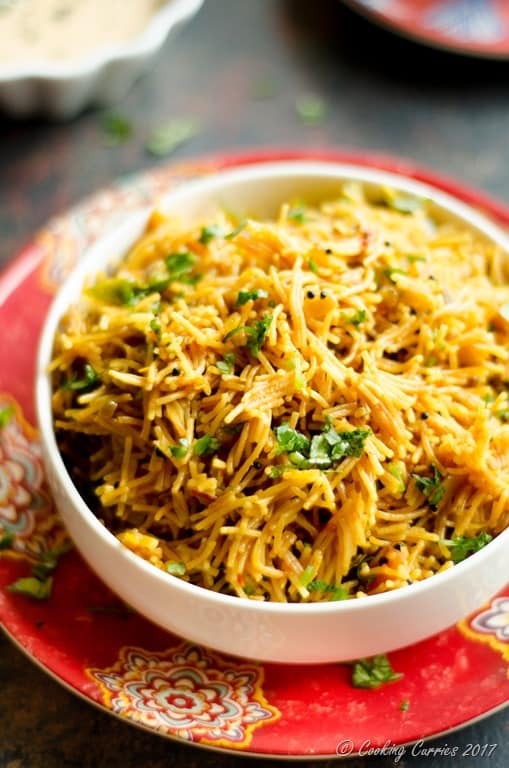 Cook over low heat while stirring gently, till all the water is absorbed and the vermicelli is cooked through. 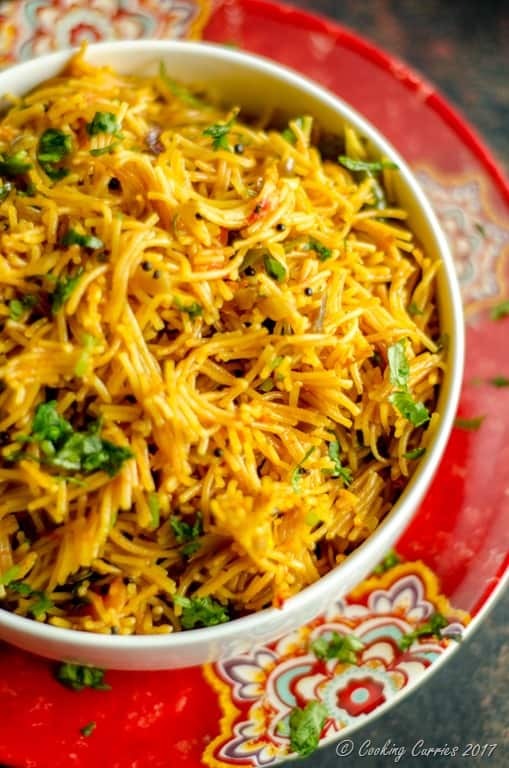 This will be the time to check for salt and other seasoning, as once you add the vermicelli and cook, you wont be able to add any more seasoning to it. I always buy pre-roasted vermicelli. 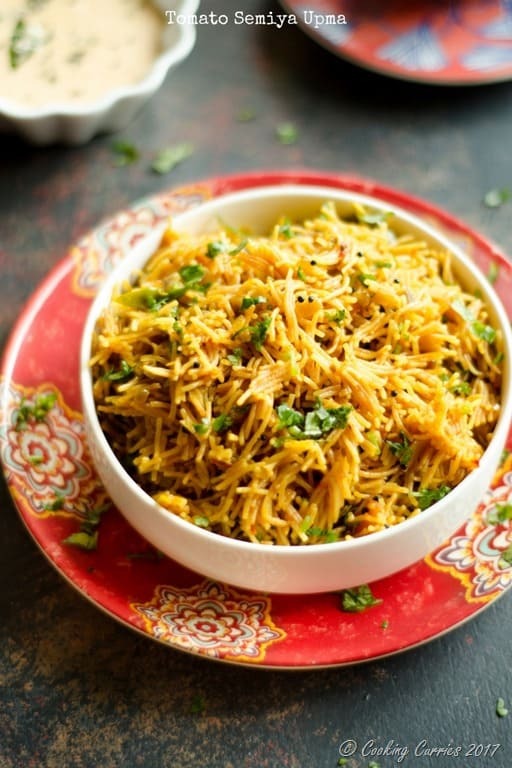 If you buy regular vermicelli, dry roast it over medium heat till it changes to light brown in color. Also, if you get the long vermicelli, you can always break it into 1-11/2 inch pieces by hand. You have made all types of upma with new style. It is encouraging to us to make it .thanks for it. Thank you very much Pranita! ?? What is the size of your cup? Looks delicious! Thank you Ruheena. The measuring cup size is a standard one cup. Thank you Ruheena! The measuring cup size is a standard one cup, 8 oz.